Charge Shot!!! : Blasts from the Pasts: Myst! 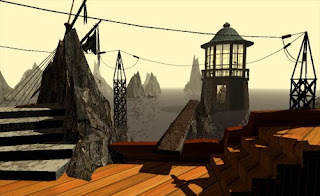 Blasts from the Pasts: Myst! So I was watching "Lost" last week, and at the point when Jack and Hurley arrive at an impressive stone lighthouse, someone remarked, "That lighthouse looks a lot like the game Myst." Wow... Myst! Now there's a game I used to be obsessed with that I haven't thought about in years. And, yeah, that does kind of look like the lighthouse from the Stoneship Age. Maybe I'll pop in my copy of the game (it is for Mac OS, after all) and relive some of my young-adult memories. But, alas! It seems that "the Classic environment is no longer supported" on my newfangled Intel-powered MacBook. 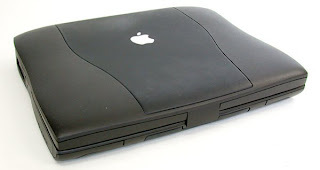 So I dug out my family's extra old black, clunky PowerBook G3, switched out the floppy drive for the CD-ROM drive, and Bam! I was back in the world of Myst I loved so well. "The moment I fell into the fissure, I realized the book would not be destroyed as I had planned." Hearing that famous opening voice over sure brought me back. I clicked on the mysterious book lying there, and was immediately transported to the deserted island landscape. Who knew that 256 colors could shine so brightly? It doesn't matter that the picture didn't fill up my entire monitor or that you could see every pixel clearly. The amazing art direction (level design, textures, music, sound) provides a sense of ambiance that few games nowadays can reach, let alone surpass. At about this time, my girlfriend turned to me and asked, "So, is this just a slideshow? Does anything happen in this game?" I tried to explain to her: "Yes, of course things happen! It's a big puzzle. You move through the environment, but you can only do it one frame at a time, cuz the game's only 3 MB. Clicking once moves you one step forward. See? Then you can turn left and right, or look up and down (sometimes). And you can click on objects to interact with them. See? If I click here, I can alter the path that the steam power takes through the pipes to send power to the...."
She had already turned back to her computer, totally unimpressed. I guess the magic is just lost on some. But enough. I can already feel your eyes glazing over. The point is, once I realized there were hidden secrets above and beyond (or below) the relatively small overworld, I immediately purchased a strategy guide and let myself be led through this amazing feat of imagination. There is something to be said against a game that requires the use of a strategy guide for its completion, regardless of how breathtaking the visual style may be. I say "requires" even though all the clues for the completion of the puzzles are right at your fingertips. It's just that it would require a near superhuman combination of insight, observation, and patience to figure them all out. Let's just say that I've yet to meet or hear about anyone who has gotten through the game without some kind of assistance. As far as story is concerned, the player only gets snippets and hints from various journals and embedded quicktime videos throughout the game. You learn about Atrus and his two wicked sons and his missing wife. And then, to top it off, there's not even really a proper ending! It's as if the co-creators, brothers Rand and Robyn Miller, knew their game would be successful enough to warrant a sequel... or if it totally tanked, no one would care about the lack of closure. Fortunately for them, the former turned out to be the case: to date, there have been four sequels, numerous book adaptations, and an MMO based on the game. The story really takes off in the first sequel, Riven. This was a five-CD behemoth, also for the Classic environment, that takes you to another fantastical world (the aptly titled Riven) and fills you in on most of the backstory you need to know. The denouement is so complete that the start of the next game, Myst III: Exile seems forced and out of place. I haven't played 4 or 5, and to this day continue to ask myself why not. But why split hairs about the current state of the franchise when what I'm really after is a little nostalgia? 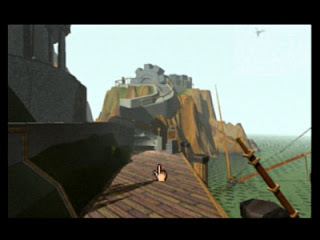 The original Myst remains untarnished in my memory. And now, additionally, thanks to my family's pack-rat tendencies, it remains untarnished on my hopelessly outdated laptop's monitor. Granted, this style of game isn't going to hold the attention of everyone - it's essentially one big elaborate beautifully illustrated puzzle - but those who succumb to its charms never forget the wonderful sense of magic and mystery.